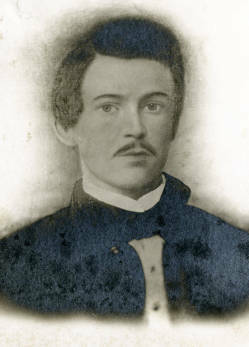 Biography & Genealogy: William Henry Morgan, Class of 1860: Genealogy: Born- Sept. 1, 1839 in Chesterfield, Va. Father- Fleming Morgan; Mother- Martha Ann. Alvis. Pat. Grandfather- Peter Kennon Morgan. No information on other grandparents. Never married, no children. VMI Record: Entered VMI- Sept. 1, 1856; Graduated- July 4, 1860 standing 13 in a class of 41. Careers: Lieut. and Asst. Professor of Math & Tactics at VMI 1860-61. Civil War Record: Appointed 2nd Lieut. of Co. F, 21st Va. Infantry July 16, 1861; Elected Captain April 21, 1862. Died- Aug 9, 1862, killed in action at the battle at Cedar Run.